You probably love taking selfies, but did you know that you could win prizes for your amazing selfies?! With the new iOS app RaceMyFace, you can join the growing trend of selfie contests. Express your personality, creativity, and brand loyalty while competing with friends for prizes and popularity. Create unique and personalized selfies that demonstrate who you are. All you have to do is post a selfie best representing the challenge of the contest. Then compete with others who want the same prize! Share your entry on Facebook to get extra votes or boost your selfie to have it be viewed more. Simply vote and boost your favorite selfies to help them beat the competition and win fun prizes. 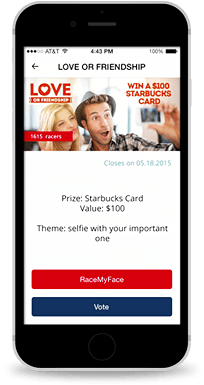 You can participate in up to 10 contests at once, using new or existing selfies. Each contest has a challenge. The challenge describes what a selfie should represent in the given contest. Contests run daily, weekly, and monthly. More contests are being added every day. RaceMyFace is the ultimate selfie contest. If you are taking selfies anyways, why not try to win a prize? I would like to hear your comments and suggestions on this exciting new photo app, which is now available in the App Store.